What are your 5 Bad Gout Foods? There are 5 bad gout foods that you must know if you want to get your gout diet working for you. This is not another of the simple lists of random food items that you read on the Internet. These are 5 important groups of foods that affect gout in different ways. I have recognized 4 of these for a long time. Recently, scientists have identified a fifth important food group that changes the way we control gout. Before I explain this new group of foods that you need to be careful with, I will recap the other 4. I will only present brief summary information here. You can find more information in my gout diet guidelines and by searching using the box at the top of each page. I also provide personal help and explanations in the gout forums. I will add relevant links at the end of this article. Purines from the flesh of animals are important, vegetables do not increase uric acid. Purines come from our own flesh, as well as the meat and fish that we eat. The only reason to reduce purine intake is to reduce blood uric acid to 5mg/dL or lower. If you do not achieve this, restricting purines has no benefit. Reducing uric acid from purine restrictions takes many months, and will have no immediate effect on the frequency of gout attacks. For more information, see my explanations of high purine foods to avoid. As I mentioned above, our own bodies produce uric acid from our flesh as part of natural cell repair and renewal. If you have more flesh, you produce more uric acid. This is especially true of muscle mass, which explains the high incidence of gout amongst bodybuilders. So most gout sufferers must avoid excess calories. For more information, see my explanations of high-calorie foods that cause gout. Excess iron causes our bodies to produce more uric acid. The exact mechanism is still under investigation, but we do know that donating blood has a significant effect on reducing uric acid and gout. In dietary terms, planning is complicated as the amount of iron contained in foods is not always available when we eat it. Also, iron absorption is affected by foods that we eat in combination. For more information, see my explanations of high iron gout foods to avoid. 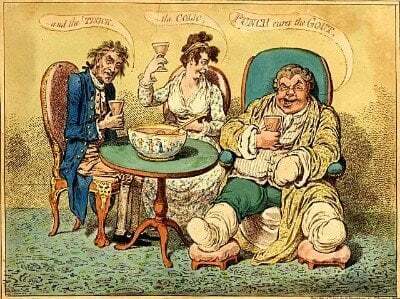 For more information, see my explanations of other bad food for gout. For a long time, rheumatologists and I have been puzzled about purines and the timing of gout attacks. We know that uric acid crystals can take many months before they grow to the point they cause gout attacks. Yet, many gout sufferers and I have experienced gout attacks within hours of eating a high purine meal. This doesn’t make sense unless something else is happening. Recent research by Joosten and others has revealed the truth. Or at least partial truth. Free Fatty Acids (FFAs) seem to be the real culprits for triggering gout attacks. They react with uric acid crystals to produce the intense inflammation we all know and hate. This significantly changes the way we should manage gout diet. Scientists now recognize that purines have been misunderstood. They still have a part to play in uric acid control, but they are irrelevant to pain control. Much of the misunderstanding is down to the fact that many foods high in fatty acids are also high in purines. I am now embarking on a complete review of all my gout diet information. I will incorporate high FFA foods to avoid with gout. At last, we have sensible explanations of how food affects the gout pain pathway. Bringing FFAs into gout diet planning adds an extra consideration. My view is that, rather than complicating matters, it actually makes gout diet planning more simple. Just as with the rest of gout treatment planning, we can now separate pain control from uric acid control. The overriding principle when you consider any of these 5 bad gout foods is, you have to determine what is bad for you, personally. Every gout sufferer has unique dietary needs. I present the facts in these articles and guidelines. In the gout forum, I can help you maintain your personal gout profile. These are the facts about you and your preferences. They will help you arrange the best gout treatment for you with your doctor. You can get personal help now. So just ask about your bad gout foods. 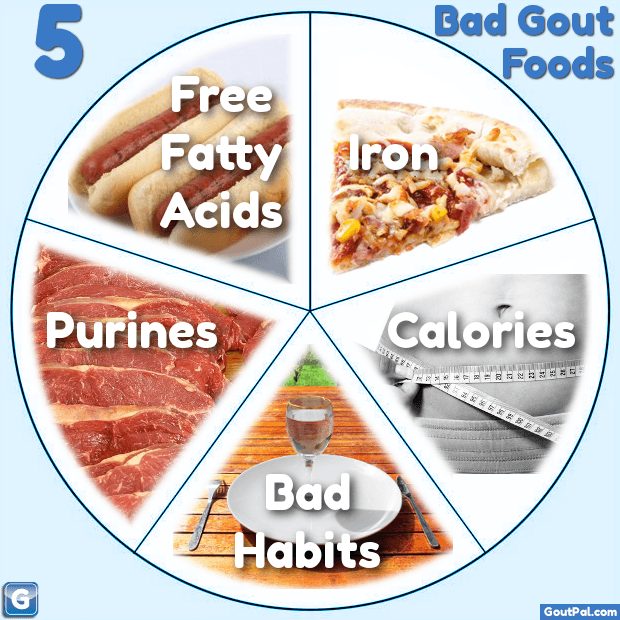 Leave What are your 5 Bad Gout Foods to browse What Foods Cause Gout guidelines.